After the execution of her friend Anne Askew on 16th July 1546, she began distributing pamphlets, and expressed the opinion that Christ, the perfect God, had not been born as a man to the Virgin Mary. She was arrested and brought to trial before Bishop Nicholas Ridley and found guilty of heresy. Boucher's views upset both Catholics and Protestants. John Rogers, who had been involved in the publishing of English Bible that had been translated by William Tyndale, was brought in to persuade her to recant. After failing in his mission he declared that she should be burnt at the stake. In the years after 1543 Joan Bocher's beliefs took an Anabaptist turn.... She was arrested, probably in 1548, and convicted of heresy in April 1549. She was then imprisoned for more than a year, for some of the time in the house of Lord Chancellor Rich, while great efforts were made to persuade her back to Edwardian orthodoxy, led by Archbishop Cranmer and Bishop Ridley of London.... When she remained adamant in her opinions, the privy council decided to proceed with her execution by burning, despite the lack of a statute under which to proceed. She was burnt at Smithfield on 2 May 1550, still upbraiding those attempting to convert her, and maintaining that just as in time they had come to her views on the sacrament of the altar, so they would see she had been right about the person of Christ. 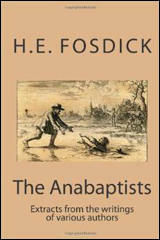 She also asserted that there were a thousand Anabaptists living in the diocese of London.